If you’ve lived in Erie for a while, you might have noticed that our city has artistic undertones just about anywhere you go. Have you noticed it on the sidewalks? Most people walk right past the heritage and don’t even realize that they’ve just ignored it. Here’s a little something to make you take a second look. For many years biking has been promoted as both a healthy recreational activity and an environmentally friendly mode of transportation. Within the last few years Erie has stepped up to personalize the recreation to our individual city. Artistic bike racks have been developed to reflect local flavor and history and installed along the trail heads of many local hiking and biking trails. Inspired by local artists these designs bring to life our very own community, and allow for safe places to keep your bicycle while your interact with the community nearby. We’d like you to check out the bike racks for yourself, so we won’t be sharing much more with you in this post. They are yet another unique resource for our community to utilize while you opt outside this summer. 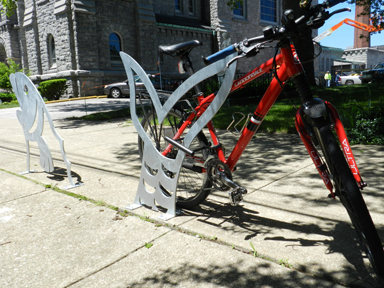 Check out the attached link for a detailed timeline of how these bike racks came about, where they are and the future expansion of the artistic bike rack initiative.